SPICE - This range is more to colorful, funky, casual and younger consumer. It is water soluble. SPICE wax range on the left, while SPICE neo wax range on the right. SPICE neo - This is similar to SPICE, but using different formulation plus UV protection. This is water soluble and made from fruit butter. If you notice #6, SPICE wax are packaged in the same way regardless for boys or girls. But for SPICE neo, wax for boys remain the old packaging, while wax for girls are in tube packaging (#7). If I have to tell you the story behind the wax in tube, your first reaction will be, "so thoughtful!!". Okay, let me tell you why. That was the time where nail arts hit Japan. Every girls love to have manicure with super bling, long, and 3D design nail arts. But it becomes hassle when those wax or cream stuck in our nails. This is why ARIMINO came out with wax in tube, specially for girls. Aha! You got it! Don't you? So thoughtful right??? PEACE - This range is designed in a simple and elegance style. Mainly for moisture and because of unique ingredients, it could retain for more than 12 hours. For styling purpose, the darker color of packaging, meaning it is for stiff and hard holding. So white color is the mildest, black is the hardest. You can get the rose scent in this PEACE range. Besides that, one specialty of this range is that it is eco-friendly. Its main ingredient is Cupuacu Oil, a highly purified oil which protects Amazon forest and create work and income for the indigenous population. I salute ARIMINO for such eco-friendly way in its products! 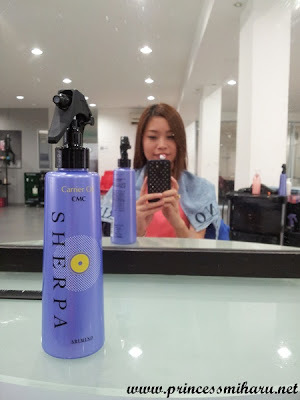 SHERPA - This is the shampoo and conditioner range. There are D1, D2 and D3. D1 is suitable for short and medium length, who wants fluffy and volume hairstyle. D2 is suitable for curly hair, where it provides protein for your hair. While D3 is for rebonding hair who wants sleek and shiny finishing. First of all, Jamie put the Sherpa carrier oil on my hair scalp. This works as a protection barrier when I color my hair. After that, Jamie starts to touched up my hair color with ARIMINO color. 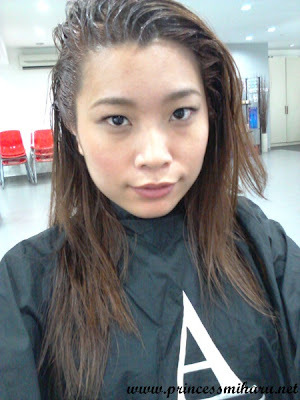 After the hair color, Jamie gave my hair a Caretrico Mabling System Treatment. 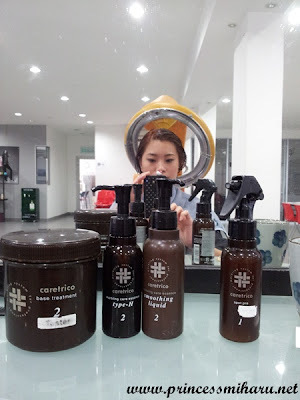 This is a treatment customize specially for your hair, depends on your hair condition. As its name sounds, Caretrico actually provides your hair 3 layers of protection. After shampoo, Jamie put spot pre on my hair to repairs outer layer of my hair and prepare my hair for second step of the treatment. Then, she mixed the base treatment, hair essence and smoothing liquid together and applied on my hair. This works for the inner layer of my hair. Wait for 10 minutes with the heat. 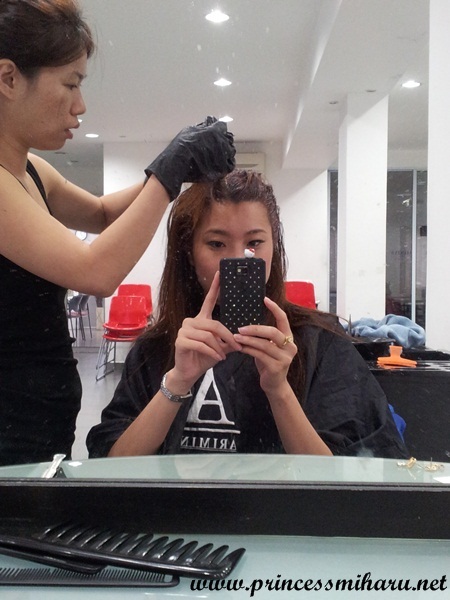 Finally, rinse off and apply the coating treatment on my hair. This last step helps protecting and seal the protein and moisture longer on hair. And ta dang!!! Look at my hair! :D The color was touched up so nicely. And the hair after treatment looks so healthy and moisturizing!! This Caretrico Mabling System Treatment is recommended once in 4 nights for very damaging hair, while for normal hair, once in 3 weeks or a month is enough. After the hair touched up and treatment, I was given 2 products that suits me, to use at home. The first one is PEACE Gloss Milk. If you have been reading my blog, you know I usually leave my hair straight. And this gloss milk can leaves my hair glossy, smooth and soft, and also maintain volume. Towel dry your hair and apply the PEACE Gloss Milk at the end of your hair. Apply the milk across the hair with your fingers. And ta da! Glossy hair! SPICE neo Curl Deco.This helps to moisturize and protect against heat and creates tip-top curl. Split your hair into parts. Spray the SPICE neo Curl Deco on your dry hair before curl. Due to ARIMINO's such professional products, we need certain knowledge and advice from experts in order to use them. Hence, it is not selling in the market. 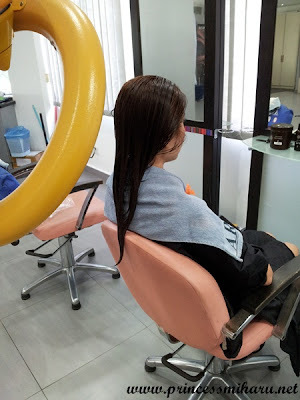 There are nearly 300 salons using ARIMINO products in Malaysia, located at Setapak, Kota Damansara, Hartamas, Bangsar, Sungai Wang, PJ, Subang, Puchong, Cheras, Klang, etc. Get your ARIMINO products at the nearest salon with the price from RM43 to RM85! Get your hair done with ARIMINO today! I'M INTERESTED ON SHERPA D3.. WHERE CAN I BUY IT ? Hi dear, where do you stay? I try to check for you. Thanks. Hi Valerie, I am in Shinjuku tokyo now. Can you please tell me where to buy this shampoo? I am having trouble locating it. Appreciate your help. Hi, I'm not sure where you can get in Shinjuku as I was mentioning Malaysia. So sorry I couldn't help you. But my friend do sell this in his saloon, if you want, you can let me know. Where can i purchase this brand's product? 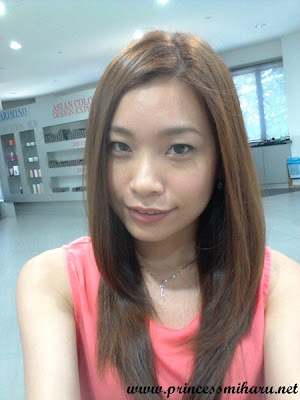 Hi Valerie, do you know any salons in KL that uses Arimino products for rebonding?